A Japanese martial art that emphasizes harmony by blending with an opponent's attack and redirecting it, as opposed to the use of strength to block and attack. There are no contests or competitions in Aikido. It is sometimes described as an "internal martial art" because it is mental as well as physical. Aikido's power comes from the coordination of mind and body and is manifested through one's center or "hara". Through Aikido, we develop confidence and ability by training the mind, body and spirit. This, ideally, results in calmness, a positive outlook, alertness and focus. This enables us to appreciate all life has to offer! Discipline and courtesy are essential for safe and effective practice. Training is normally with a partner. Students are encouraged to train with all other students. 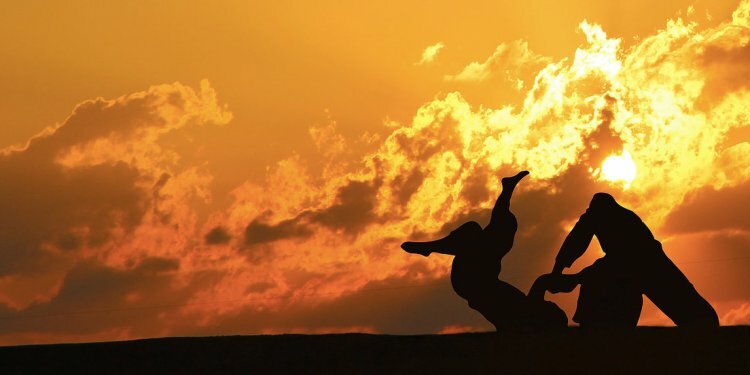 In practice, one partner is the attacker (uke) and the other, the defender (nage). After four attacks, the partners switch roles. Instructors demonstrate the technique which students are encouraged to study and emulate. Senior students are expected to sincerely assist less experienced students. New students should observe and emulate the senior students actions. Ranking in Aikido is earned by a formal examination. The students demonstrate their proficiency to themselves and the instructor. Respect, for each other, the instructor and the art are essential for safe, effective training. We bow on entering or leaving the place of practice (dojo), at the opening and closing of class, and to partners. The Japanese term, "onegai shimasu", is said at the begining of class by all members to the instructor and during training to each new partner. It is literally translated as .I ask you please. and is a formal way of requesting to train together. Japanese terms are learned as one practices - it is nothing to stress about! You will learn them over a period of time and training. I began my Aikido training in 1969 in Southern California. My first teacher was Shoji Sensei, 4th dan, who began his training in Maui in the early 50's with Suzuki Sensei and also with Tohei Sensei. The training was at a YMCA two times a week. Within a year I had started a dojo under the direction of Kobayashi Sensei, 4th dan, where I worked. He was also a student of Tohei Sensei and the head of the western region for the AikiKai. Classes were at lunch three days a week. Within the next year, I was doing breathing training two mornings a week. This allowed training 7 days a week and kept the evenings free for the family. I was very fortunate to be able to train with two very different, yet complementary Senseis. I received my Shodan in 1973. This daytime schedule also allowed intensive training when visitors from Japan came over for extended stays. I was able to train with Senseis Imaizumi, Oshima, and Shiohira during this time.